The Motherwell and Bellshill BB Battalion football team of 1956, including John Martis. Almost 60 years have passed since this photograph - supplied to us by reader John Anderson - was taken. The team pictured is the Motherwell & Bellshill District Battalion Boys’ Brigade side that played the Paisley Battalion team at Love Street, former home of St Mirren, in 1956. 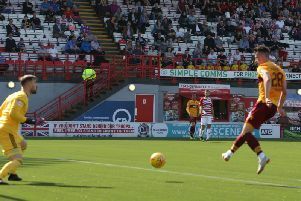 The fixture was an annual event between the two battalions with the alternate game being played at Fir Park. The 1956 encounter finished in a 1-1 draw. Among those pictured are John Martis (back, third right), who went on to play for Motherwell, making almost 300 appearances for them between 1957 and 1969 and winning one cap for Scoland, and John Bonomy (back, third left) who went on to become chief executive of Motherwell District Council. The team lined up as follows: J Ingram (9th Motherwell), J Bonomy (13th Motherwell), J Anderson (2nd Motherwell), J Lawrie (13th Motherwell), J Martis (3rd Motherwell), R Colquhoun (13th Motherwell), J Anderson (4th Motherwell), A McClymont (11th Motherwell), A McPherson (2nd Bellshill), J Braidwood (9th Motherwell) and T Hamilton (1st Mossend).